Located in the hills amongst the coconut groves of the Chaweng Noi rainforest, Jaliza offers its guests a perfect combination of beauty, authenticity and privacy. 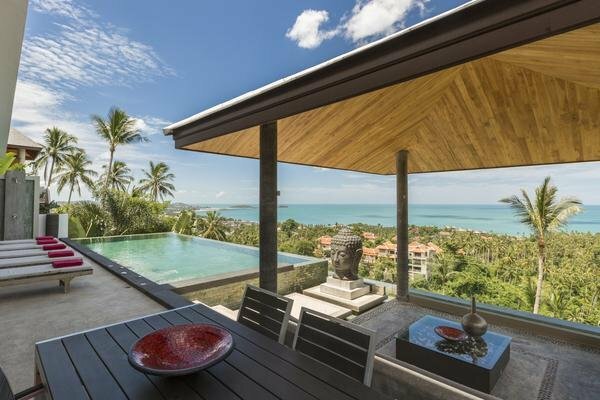 Surrounded by jungle landscape, the villa boasts stunning panoramic ocean views, interrupted only by the vast coconut groves between the property and Chaweng Noi beachfront. A combination of natural and modern materials makes this contemporary designed villa a place of peace and tranquility, blending harmoniously into its surroundings. Chaweng Noi, often likened to the Beverly Hills of Samui, is conveniently located within a 12-minute drive from Koh Samui Airport, a 7-minute drive from the nearest supermarkets; Tesco, Big C and Makro stores. Its a 5-minute drive to the Bangkok International Private Hospital. The nearest beach 800m from the villa. Jaliza Villa is safely situated in a gated community; a peaceful and quiet escape from the hustle and bustle of the Samui nightlife. The 800SqM 6 bedroom villa offers a stylish and spacious living environment, adorned with a refreshingly minimalistic and stylish theme that runs throughout the property. Upstairs comprises of three bedrooms; stunning master bedroom offering king size bed, sofa and ensuite bathroom. Second bedroom offers either twin beds with guest bathroom and the third bedroom en suite with a king-sized bed. Lower ground floor offers 3 further bedrooms, ensuite with king-sized beds and a family room with a bunk bed. There is an open plan games room, complete with pool table and mini fridge. Every room on each floor opens out onto a joint balcony offering magnificent sea views. Ideal for families, groups, couples, with a large area for entertainment. Children must always be supervised around the Villa and Pool.